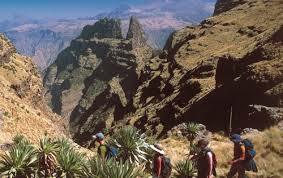 Ethiopia as large as France and Spain combined, has an area of 1,112,000 square kilometer. About 65 percent of the land is arable, with 15 percent Cultivated. From the North and running down the center and are the Abyssinian highlands. To the west of the chain the land drops to the grasslands of Sudan, to the east to the desert of the Afar. The current population is about 70 million, making it the third most populated country in Africa. Ethiopia is in the GMT + 3 hours time zone. Ethiopia follows the Julian calendar, which consists of twelve months of 30 days each and a thirteenth month of five or six days during each leap year. The population is estimated at 65.3 Million , over 50 percent of whom are under 20 years old. The average number of inhabitants per square kilometre is 49. 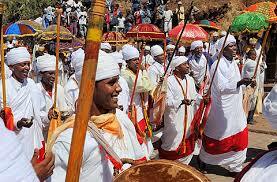 The ancient Ethiopians were of Hamitic stock who later intermingled with Sematic immigrants from southern Arabia.